Drawing 10,000 Birds is excited to announce a new partnership with Two Loons! We cannot wait to introduce the scientific and artistic abilities of Two Loons to create even more cool bird products. Check out their Facebook page here, and look forward to our collaborative projects in the store coming soon! Click above to go to the Two Loons Facebook Page! After traveling through 13 countries and 46 states, Two Loons has encountered over 1,000 species of birds. Check out the incredible photos from the adventures, available as cards and as various sizes of prints! Two Loons bird hats are famous in the bird world! Get your own hand-knit bird hat here! 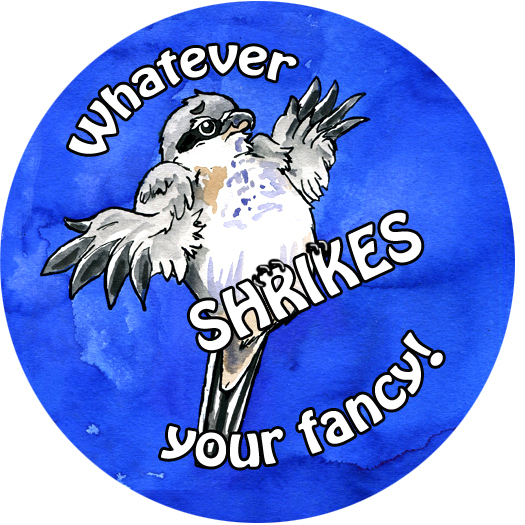 Two Loons is the genius behind the puns on our nerdy Bird Pun buttons and magnets! Having thought up over 50+ puns and counting, expect to see many more Bird Pun designs added in the future!